Planning for the first half of 2019 is underway at CRU, and we have prepared a date claimer with an overview of some of the workshops we will be offering between February and June. A number of the events in February are open for registration now and the others will open for registration in the coming weeks. We will update this post with further details of these as they get closer. We know that some people who are self-managing or plan managing their NDIS supports would like to use those funds to pay to attend events. 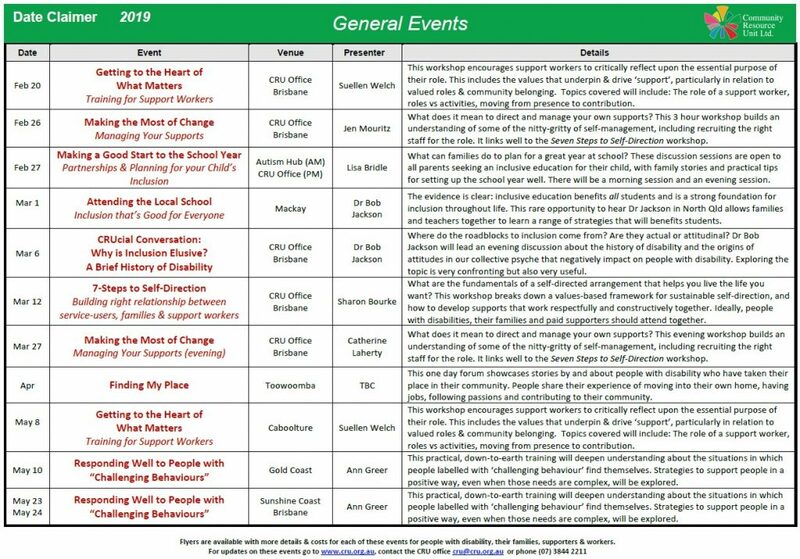 To assist you to determine if these events are a good match with your goals and therefore a reasonable and necessary expense, we have developed Learning Objectives for each event that you will find on each event’s Eventbrite page, linked below. If you have any questions about this don’t hesitate to give us a call. We have created a flyer titled “Using your NDIS Plan at CRU” which you may also find helpful as you plan for 2019. We have an accessible version of this flyer which can be downloaded here. The role of a support worker is complex and multi-faceted. Paid staff can make a significant contribution to a person’s life – enabling the person to live a rich life and pursue their own unique goals and dreams. What lies at the heart of the role is, however, frequently invisible. When we fall into the habit of talking about “hours”, and tasks, routines and schedules, it’s easy to be distracted from what really matters about supporting people well.